Cutting discs for metals ensure an high quality result and are used for fast and clear cutting of tubes, outlines, grills and metal sheets. The allow a low temperature and avoid the material deformation. 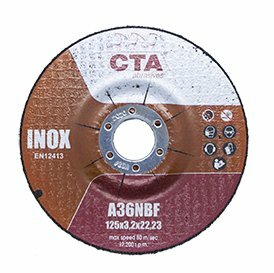 Cutting discs with depressed centre can be used on iron, inox and metals. Grinding discs are used for hard operations such as deburring or welding removal, with low noise and high removal speed. Grinding discs depressed center are used for hard working as deburring and welding removal, with low noise and high performances. 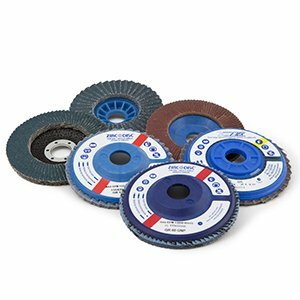 Flap abrasive discs are successfully used for welding and imperfection removal, in surfaces junctions and for important removal on every kind of surface (metal, wood, resins). The particular construction allows the best use of flaps and makes possible to obtain a perfect grinding. Based on the abrasive and grit can be used for operations on ferrous and nonferrous metals, stainless steels and metal alloys. Cutting discs ensure high performances and they are used for quick and accurate cut of tubes, profiled surfaces and metal sheets. They ensure also a low warming of the worked piece avoiding deformation.